Bertken de Leede is the business advisor of January for the Small Farmers, Big Deal Campaign! She shares with us why advice and training is often more relevant to local development than development aid. Bertken: “Agrittera’s approach has always been to put the farmer cooperatives in the driving seat instead of NGO’s or governmental organizations deciding for farmers. Bottom up investment creates the most sustainable growth. But Agriterra has also changed a lot over the last few years. When I started working here Agriterra was mostly a project- and financing organization in the development aid-sector. We have evolved into an advisory organization, and financing farmer organizations is not our core business at all. Our dependency on subsidies will gradually reduce. 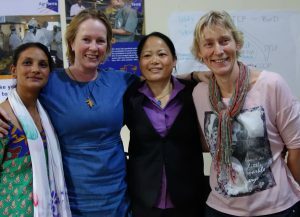 Bertken: “As the business advisor for Nepal, I work every day to connect Dutch and Nepalese organizations. A large part of this is focused on knowledge transfer from the Netherlands to Nepal. My role is to facilitate all of this. I try to match the needs of local farmer cooperatives with advice missions. I scout the Dutch agrifood sector for experts on different subject matters to provide trainings to farmer cooperatives. I organize and prepare all of these trainings and workshops with the experts. You can imagine that the education levels vary widely in a country like Nepal, so a customized approach is necessary. 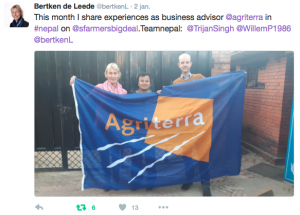 Next week, Bertken will share how Agriterra helped to set up a business deal between a Dutch food entrepreneur and a tea cooperative from the Himalaya, resulting in high-end tea for the Dutch market. Read more about making a deal in Nepal and contact Bertken.